Monday is Memorial Day, that exceptional day of each year all Patriots reserve to formally honor the service and sacrifice of generations of uniformed Patriots now departed — Soldiers, Sailors, Airmen, Marines and Coast Guardsmen who honored their sacred oaths “to support and defend” our Constitution and the liberty it enshrines. In this era, however, our “progressive” academic institutions choose not to teach genuine history or civics. Consequently, many Americans have no sense of reverence or obligation for the liberty they enjoy. Indeed, many will “celebrate” Memorial Day as any other holiday, with barbecues, beer, and commercial sales at local malls. Simply put, they have sold out Memorial Day. However, those of us who do understand the cost of liberty will advance this custom in honor of fallen Patriots, with both formal rites and simple prayers. For it is through the legacy of these Patriots that we are able to see most clearly our nation’s noble history of eternal vigilance in support of liberty. And the cost has been incalculable. Generations of Patriots have since pledged their lives, fortunes and sacred honor in defense of the Essential Liberty codified by our Founders in the Declaration of Independence and our Constitution. Our nation has, time and again, spent its treasure and spilt its sons’ blood, not only for liberty at home, but also abroad. Since the opening salvos of the American Revolution, nearly 1.2 million American Patriots have died in defense of liberty. Additionally, 1.4 million have been wounded in combat, and tens of millions more have served honorably, surviving without physical wounds. These numbers, of course, offer no reckoning of the inestimable value of their service or the sacrifices borne by their families, but we do know that the value of the liberty they have extended to their posterity — to us — is priceless. While I greatly appreciate Gen. Patton’s sentiment, I must respectfully disagree with his premise. I both mourn their absence and thank God they lived. Etched into the base of the Iwo Jima Memorial in our nation’s capital are the words of Adm. Chester Nimitz, his timeless tribute to the Marines who fought so valiantly there during World War II: “Uncommon valor was a common virtue.” Such valor has attended every conflict involving American Patriots. Not to be confused with men of such virtue, last week, Barack Hussein Obama addressed the graduating class at the United States Military Academy. His minions brokered Obama’s appearance before the latest Corps (pronounced “core”, not “corpse”) of Cadets in the Long Gray Line, in an effort to burnish his thin veneer as “Commander in Chief” of our Armed Forces. Obama used the occasion to dress up his strategy of appeasement. In other years, men of somewhat greater stature have addressed the USMA, perhaps the most memorable being General Douglas MacArthur, who delivered his address on “Duty, Honor and Country,” without the assistance of teleprompters, or even notes. I invite you to view these Memorial Day tributes at the Patriot YouTube Channel. Remember also that all purchases from the Patriot Shop support our Mission of Service to our Armed Forces. Mark Alexander is the executive editor and publisher of the Patriot Post, the Web’s Voice of Essential Liberty. I agree Mark, there truly is a cost to freedom, and it’s unfortunate that, like you said, many Americans have no sense of reverence or obligation for the liberties enjoyed. 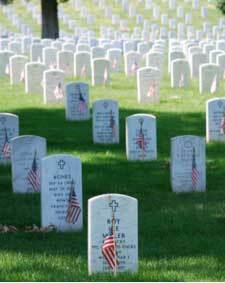 We need to remember and honor the sacrificial price so many have paid for our freedom, and teach our future generations to do the same. All of these can be found on the resource page “Why is America Free? : Insight from the Founders and other great Americans in ’41 Things Every Citizen Should Know.” It even includes built in “Memorize Now” buttons (the site is a free memorization app).